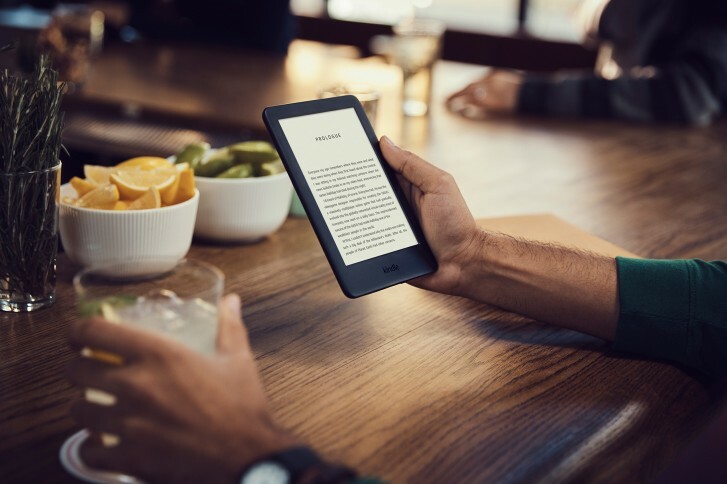 Amazon has launched an updated version of its cheapest Kindle. For the first time, the base model Kindle now comes with an illuminated display. The new Kindle features a 4 LED front lighting system (an e-ink display is front lit, as opposed to being backlight like an LCD). In comparison, the more expensive Kindle Paperwhite has a 5 LED lighting while the top of the line Kindle Oasis has 12 LED lighting. Still, 4 LED is better than no LED, and the Kindle features adjustable brightness for comfortable reading in all lighting conditions. The 6-inch display itself has also been updated with a newer panel that has higher contrast. It's also a capacitive touchscreen now for fewer accidental swipes. Unfortunately, at 167 ppi, the new model still has the same pixel density as the previous one. In comparison, the more expensive Kindle Paperwhite and Oasis have a 300 ppi display, which makes the text look considerably sharper and print-like. The new model also features a slightly updated design, which is thinner and lighter. Apart from that, this is still pretty much the same basic Kindle as before, which is to say, it's still a great tool for reading on the go. Sure, the more expensive models are nicer with a few extra bells and whistles but if you just want to get into reading, this base model will be perfectly fine and now with the backlight, it will no longer become useless in the dark.